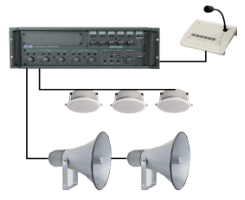 Public Address (PA) systems are most commonly used in schools, hospitals and stores where messages need to be relayed to a large group at the same time. In a school setting, a principal may use a public address system to relay the morning's announcements or a tornado drill, while a store may use the system to page a worker for customer service. Whatever your needs are, Coss Communications LLC can create an ideal public address system for your unique facility, while working within your price point. When it comes to quality, we don't miss a beat. That's why we provide only the best public address systems from reliable and cutting edge manufacturers without compromising affordability. As such, we offer public address solutions from the leading Public Address System Manufactures. We have been installing and servicing pa systems since 1985 in the following industries.